Now you can own a Donald Trump Candle. This is not just any candle but one that is shaped like the head of Donald Trump, this candle is about 2.5 inches tall and 2 inch wide and really looks like the face of President Trump. The hand made candle is made from paraffin wax with a hint of sage. 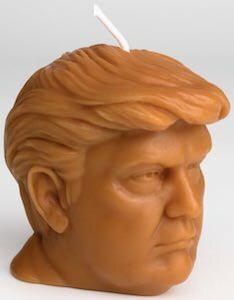 A candle like this is a great present for anyone that really like Donald Trump but also for people that really don’t like him because they can really burn Trump down as there is a candle wick on top of his head ready to be lit.